Etihad Guest usually wouldn’t be my first program to convert points to miles but they have some program partners with very reasonable redemption rates. The offer is valid for all Points to Miles conversions made between 01 April and 30 April 2019 both days inclusive. Once the Miles transfer request is initiated it cannot be reversed. This offer is subject to the Terms & Conditions of the Etihad Guest Programme. 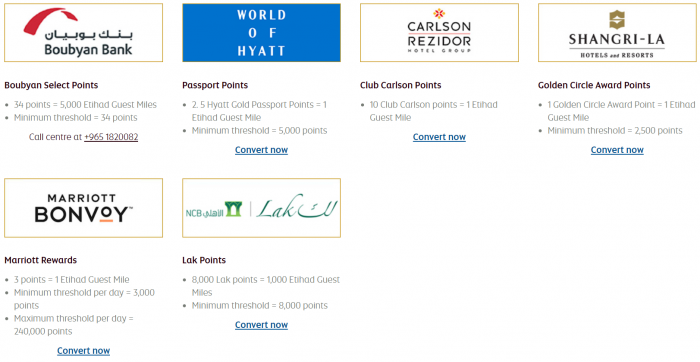 A valid Etihad Guest membership number is required to successfully perform the conversion. The Etihad Guest member will be responsible for quoting the correct Etihad Guest membership number to the participating conversion partners for the conversion activity. Terms and conditions governing the existing points transfer partners will apply. The promotion is applicable for any member who transfer’s their points from a qualifying Partner loyalty programs to Etihad Guest Miles. The eligibility of the bonus miles for a specific member will be done based on the validity of the promotion and the date of conversion provided by the partner for that respective member. Base Etihad Guest Miles transferred by the member will be awarded as per the applicable conversion ratios of each respective partner. Bonus Etihad Guest Miles earned during this promotion will reflect in the member’s Etihad Guest membership account within 15 working days of the end date of the promotion. If an Etihad Guest member holds credit cards and/or Hotel loyalty program cards of different banks and hotels and transfers the rewards points to Etihad Guest Miles under this promotion, then the number of Bonus Guest Miles he/she will earn will reflect separately in the members account for each partner. The above promotion construct is valid only for the all Points Transfer Partners, which fall under the Points Transfer programme and governed by the transfer ratios and minimum thresholds applicable for these respective partners. Bonus Etihad Guest Miles will not be calculated on a retroactive basis under any circumstances i.e. credit card/ hotel reward points transferred to Etihad Guest Miles and posted into the membership account during the promotion period but for which the transfer request was placed outside the promotion period will not qualify for the bonus miles promotion. Etihad Guest reserves the right to withdraw or cancel the promotion or modify or alter the terms and conditions of such promotion at any time. Participation under this promotion is purely voluntary for the members. The decision of Etihad Guest will be final and binding under this promotion and no disputes will be entertained in this regard. This offer cannot be clubbed with any other transfer offer.